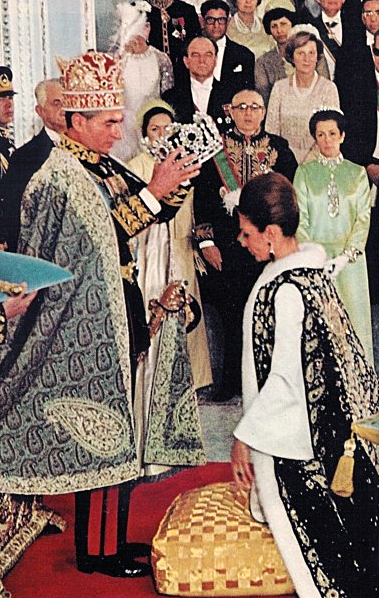 Our look at the jewels worn by Farah Pahlavi during her tenure as Iran's empress continues today with a glimpse at her 1967 coronation jewels. When Farah Diba married the Shah of Iran in 1959, she became the country's queen. Her new husband had already ruled Iran for almost two decades; he took the throne in 1941 when his father abdicated. But he had delayed his coronation, reportedly believing that he should only be crowned when he felt he truly deserved it. That moment apparently arrived for him in 1967. The imperial coronation was held on October 26, and the Pahlavis took on new titles: shāhanshāh (which means "emperor") and shahbanou (or "empress"). The crown that Mohammad Reza Pahlavi wore at his coronation had been used for a previous Iranian ruler: his father, Reza Pahlavi. It was made for his 1926 coronation by Haj Serajeddin, an important Iranian jeweler, using stones from the Iranian imperial vaults. The gold and silver crown includes a red velvet cap and is studded with a variety of gemstones, including white and yellow diamonds, emeralds, sapphires, and pearls. A new crown had to be made for Empress Farah's coronation, however. It had been centuries since an Iranian empress had been crowned, and no appropriate crown existed. The task of making the new crown fell to Van Cleef and Arpels, who constructed the piece out of white gold and green velvet. Farah and other important figures in Iran consulted on the design of the piece. Van Cleef and Arpels also made a large gold and platinum necklace for Farah to wear on the coronation day. 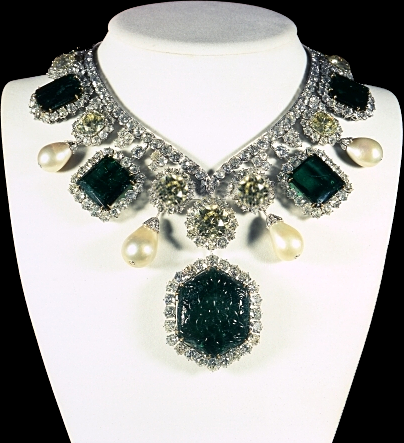 It features a large carved emerald as the central pendant, plus additional emeralds, white and yellow diamonds, and pearls. Farah also wore a pair of coordinating earrings by Van Cleef and Arpels. Her white gown and coronation robes were made by Marc Bohum for Christian Dior. Her '60s updo was both fashionable and an excellent anchor for that enormous crown. Here's a view of the elaborately embroidered robes. Farah's elder son, Crown Prince Reza, sat beside his parents during the coronation ceremony. 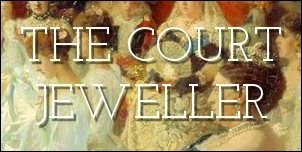 The jewels worn during the imperial coronation were state property. Today, they're still on display to the public at the Central Bank in Tehran.